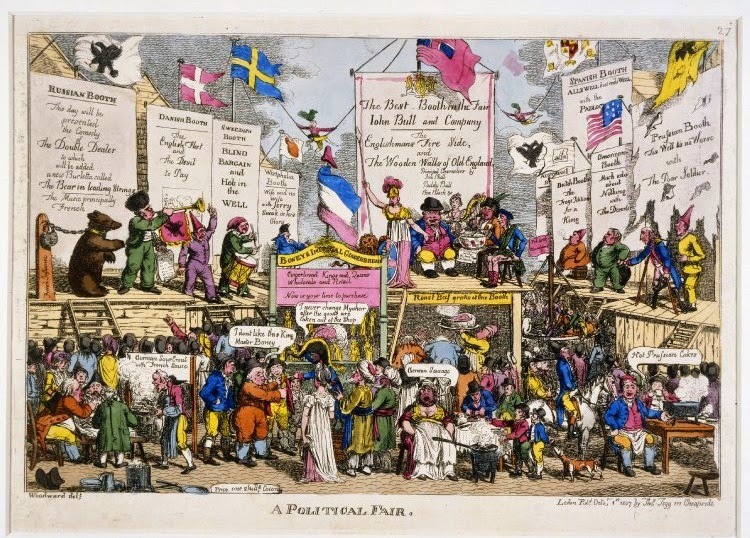 A crowded fair-ground, full of spectators, attractions, performers, placards, and flags. The German stall sells “German Sour Crout with French Sauce” and a waiter hurries with a steaming dish towards Germans at a table. The Russian Booth claims that “this day will be presented the Comedy of The Double Dealer to which will be added a new Burletta called The Bear in Leading Strings – The Music principally French”. The bear, on its hind-legs, is padlocked to a post inscribed with the words “French Influence”. The biggest, largest, most central booth is the British one. It says: “The Best – Booth in the Fair John Bull and Company – The Englishman’s Fire Side, and The Wooden Warn of Old England, Principal Characters by John Bull, Paddy Bull, Ben Block &c.”. On the stage, Britannia is pointing her spear to a group seated round a punch-bowl: John Bull smoking a long pipe, Erin with her harp, a fat Welshman with a leek in his hat, and a lank Scot in Highland dress. Apart from John Bull, they are all drinking and toasting to “Old England for ever the land Boys we live in”. Next to Britannia stands her lion, supporting her shield. 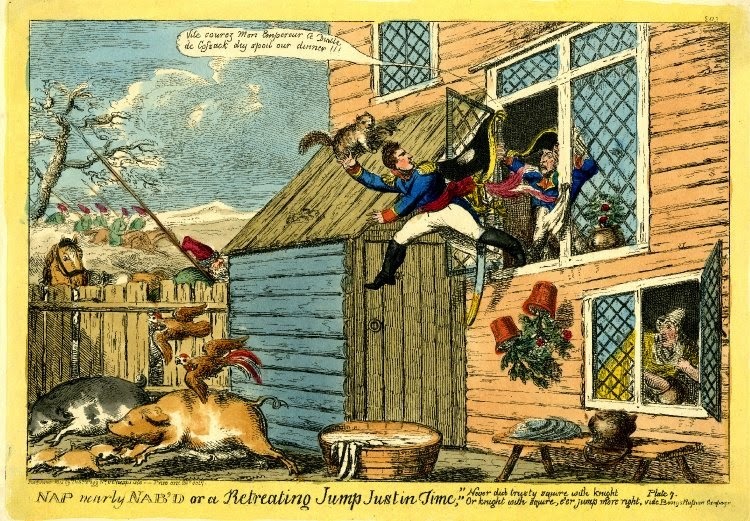 The Prussian’s attraction is “Tis Well tis no Worse” with “the Poor Soldier”. They are two comic operas. On the stage, stands a Prussian officer with wooden legs, supported on crutches. The Prussian flag is tattered. The American Booth is showing “Much ado about Nothing” with “The Deserter” [a musical drama]. The Austrian Booth is almost completely hidden. You can see only the flag displaying the Hasburg eagle. On the ground, the French booth is displaying a large tricolour flag surmounted by the cap of Liberty. The inscription reads: “Boneys Imperial Gingerbread, Gingerbread Kings and Oueens Wholesale and Retail, Now is your time to purchase.” A Dutchman is complaining about his purchase, saying “I don’t like this King Master Boney”. Napoleon replies: “I never change Mynheer after the goods are taken out of the Shop”. 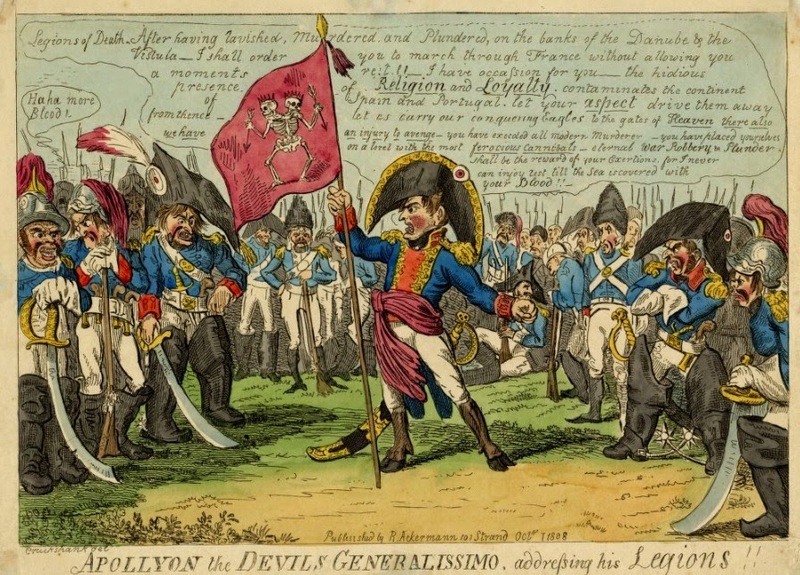 Napoleon, whose trademark boots have been replaced with cloven hoofs, stands in the center of a semicircle of scowling and bloodthirsty soldiers. He’s waving a flag decorated with a double-headed skeleton holding arrows. He says: “Legions of Death, After having Ravished, Murdered and Plundered, on the banks of the Danube & the Vistula–I shall order you to march through France without allowing you a moments rest!! I have occasion for you–the hideous presence of Religion and Loyalty contaminates the continent of Spain and Portugal, let your aspect drive them away from thence–let us carry our conquering Eagles to the gates of Heaven there also we have an injury to avenge–you have exceeded all modern Murderer–you have placed yourselves on a level with the most ferocious cannibals–eternal War Robbery & Plunder shall be the reward of your Exertions, for I never can enjoy rest till the Sea is covered with your Blood! !” A soldier laughs “Ha ha more Blood!,” not realising Napoleon has predicted he and his comrades will have to spill their own blood too. 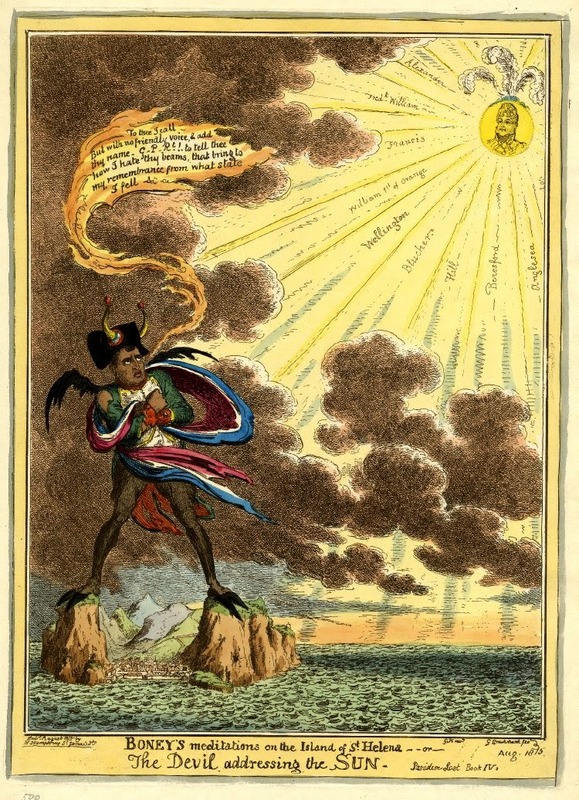 This print refers to Napoleon’s disastrous war in the Iberian peninsula. 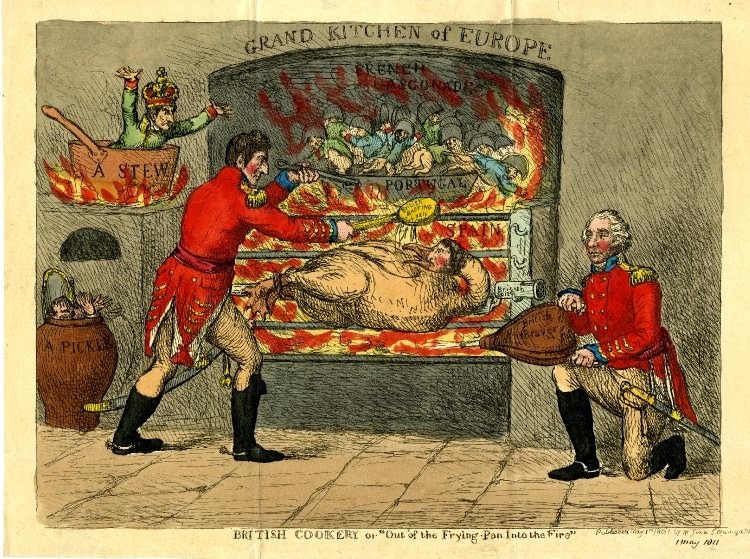 In the “Grand Kitchen of Europe”, Wellington is basting, on a bayonet inscribed “British spit”, a goose with a human head. With his left hand, he’s holding a frying-pan inscribed “Portugal”. Inside it, there are many French officers which are trying to escape by leaping into the flames. Graham (another general), is plying bellows inscribed “British Bravery”. 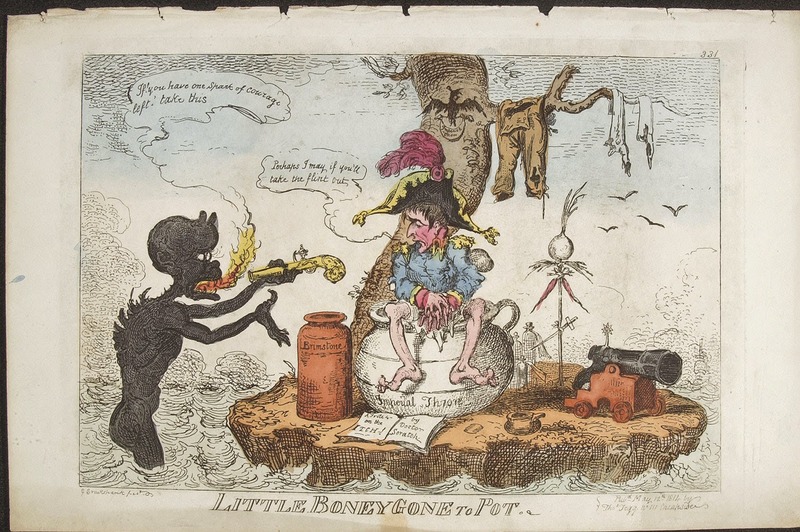 Behind Wellington, on a large large rectangular charcoal stove, there’s a saucepan inscribed “A Stew”, from which Napoleon, wearing his crown, is emerging. On the ground, there’s a jar inscribed “A Pickle”. Ney, Marshal of the Empire, is inside. General Frost shaving Boney with a razor inscribed with the words “Russian steel”. The general, from whose nostrils issue snow, sleet, and cold winds, says: “Invade my country indeed! 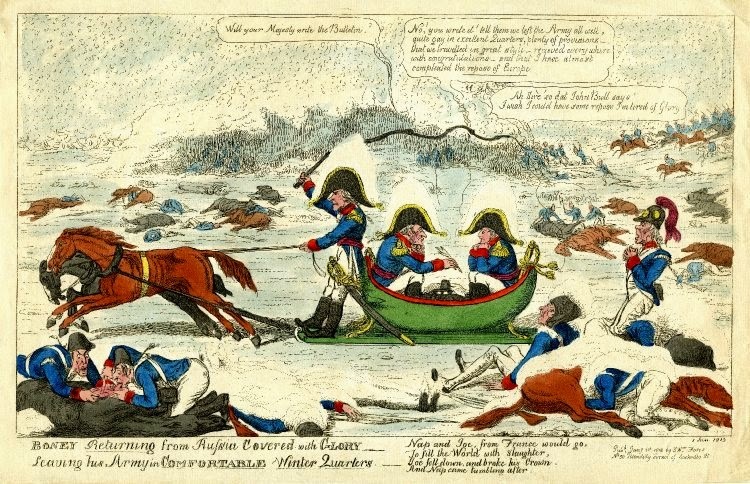 I’ll shave – freeze – and bury you in snow, you little monkey.” Under his feet, lie Napoleon’s troops. The emperor of the French, almost completely frozen, is begging for mercy. 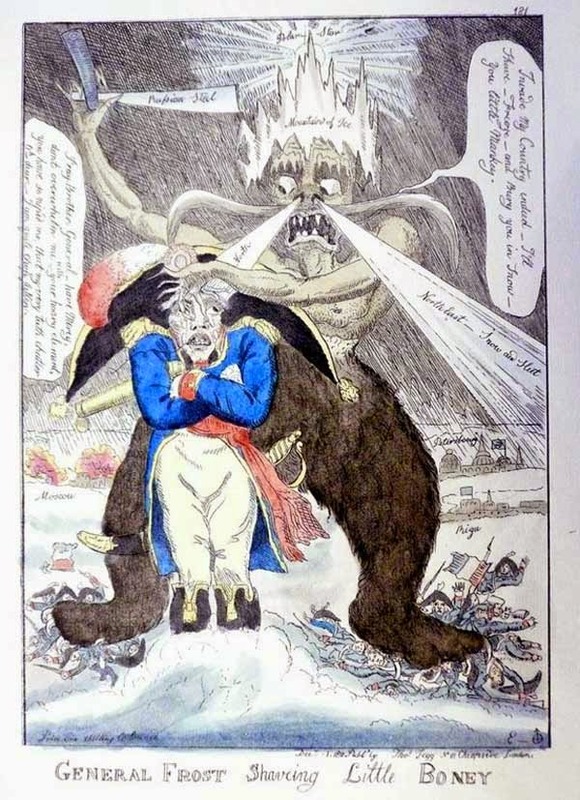 This illustration refers to the retreat from Moscow. 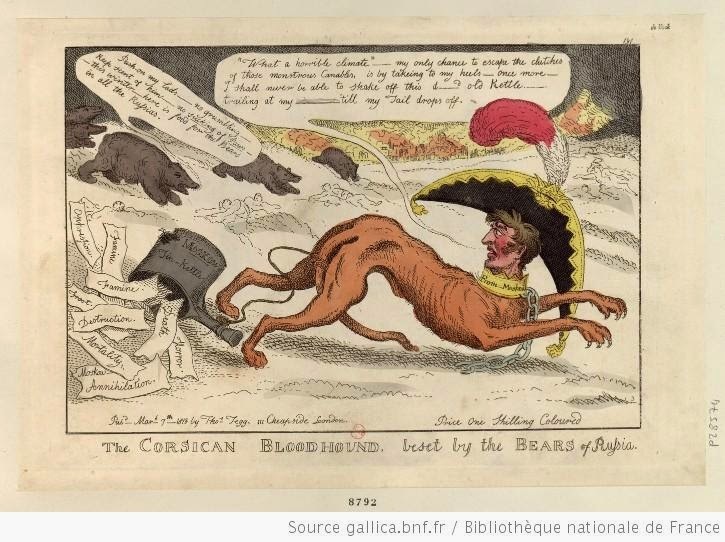 Napoleon, here represented as a mongrel bloodhound with a tin kettle tied to his tail, is closely pursued by Russian bears. One of them is shouting: “Push on, my lads. No grumbling; keep scent of him; no sucking of paws this winter, here is food for the bears in all the Russias.” From the kettle emerge various pieces of papers, inscribed with the words oppression, famine, frost, destruction, death, horror, mortality, and annihilation. 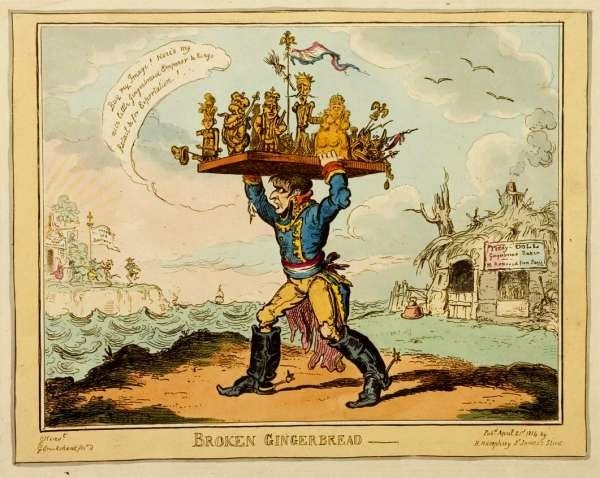 Napoleon, wearing a tattered uniform, is carrying a tray of gingerbread royals, those he had installed on the thrones of the countries he conquered. He’s saying: Buy my Image! Here’s my nice little Gingerbread Emperor & Kings Retail and for Exportation!” His bakery, now run down and closed, bears the signs “Tiddy-Doll Gingerbread Baker. NB Removed from Paris.” On the other side of the sea, the Bourbons are triumphantly returning to France. Poor Napoleon! Those English satirists could be quite mean!